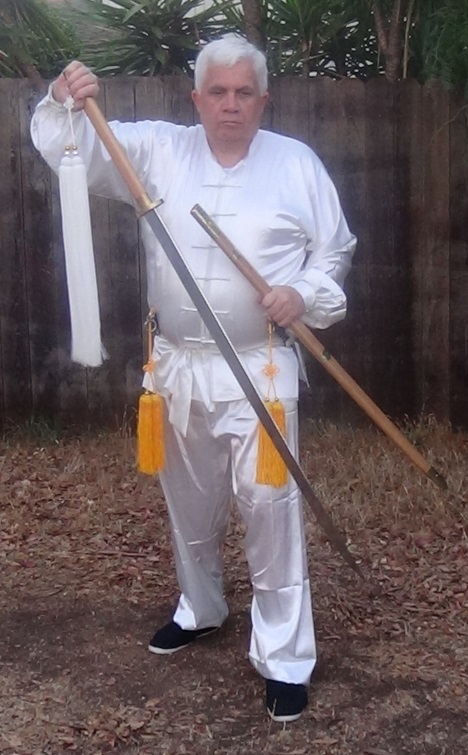 Miao Dao at the top (in my right hand) with Bagua Big Saber (in my left hand) below it. Both are really two-handed blades – too slow to move with one hand even if one is really strong. One handed cuts will usually lack authority as well. Nevertheless, happy to fight with either one. They echo the classical European scenario of foil versus saber – the foil is faster but has to work hard to overcome the hitting power of the saber. The white blotches on the right sleeve are not bleaching gone bad but rather just very transitory effects of sunlight. Photos from Shuanglin Temple in Pingyao China. 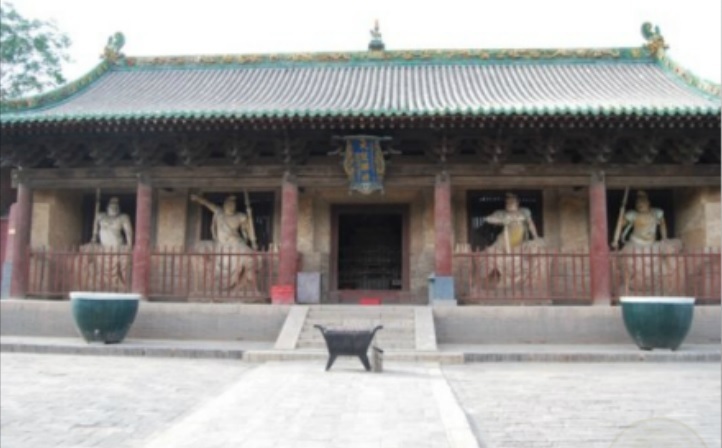 Pingyao is both a county in Shanxi and a city. 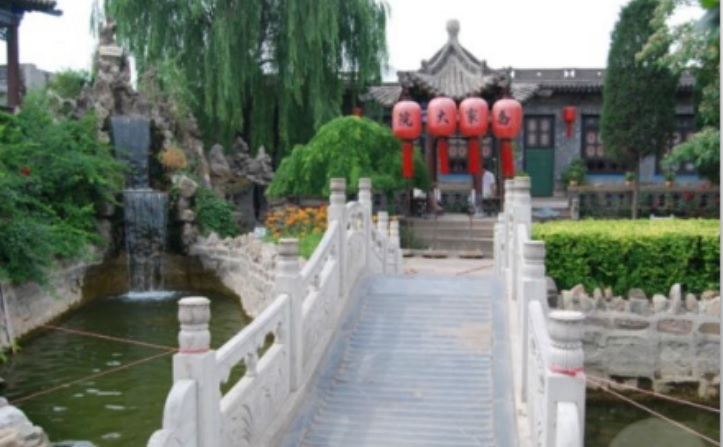 The city itself is famed for its overall ba gua design and for being the financial hub of China for centuries. The temple is internationally famous for its collection of more than 2,000 decorated clay statues that are dated to the 12th-19th centuries. [ The third photo shows someone doing a set with a melon hammer and a wolf teeth mace. A rather exotic combination. A very worthwhile book is now available again from Plum Publications. Wujishi Breathing Exercises is only about 100 pages but it details many of the intricacies of breathing both during static mediation and during dynamic martial arts. The book is a collection of explanations from the most illustrious Cai Song Fang. At least the English language version of 1986 went out of print but has, with much labor and a great deal of love, been resurrected by the fine folks at Plum. More about the book can be found at http://www.plumpub.com/sales/bagua/collbk_yiquan.htm. Also mentioned on the page are two books by Jan Diepersloot. Jan’s web page is http://www.warriorsofstillness.com. 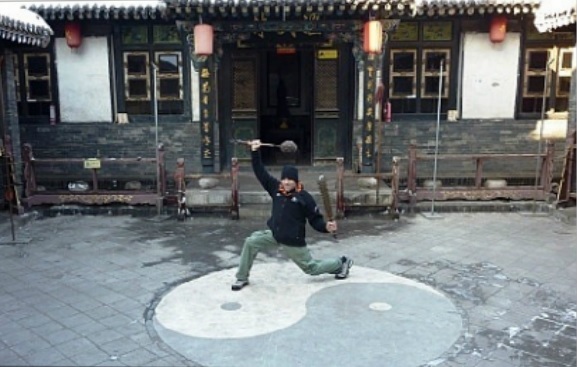 There’s a fair amount of material about Cai Song Fang in Qigong of the Center-Essence of Taijiquan which is volume I. Now out print and out of stock at Plum. 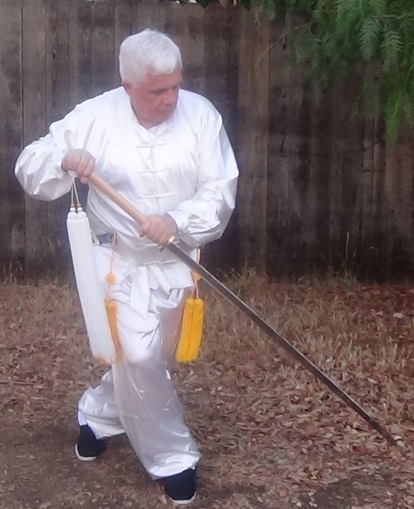 The Tao of Yiquan – The Method of Awareness in the Martial Arts is volume 2 and it is, I believe, available. Volume 3 has a working title of Warriors Of Perception: Sensory-Motor Integration in the Internal Martial Arts. It is several years late in getting published. Send an encouraging note to Jan.
A lot of latent energy built up by the spiral movements up to this point. When the position resolves the blade has a great deal of velocity even as it moves in a circle. 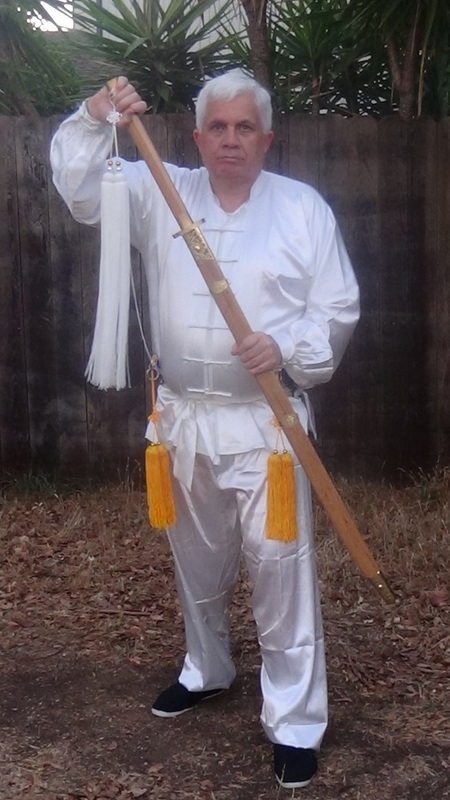 The gold tassels are two Shaolin daggers – a third is in the sash near the center of the back. The white tassel on the Miao Dao indicates a sharpened weapon to be used in mortal combat. By the time the FedEx package (originally due Saturday; then revised by FedEx to Tuesday but actually delivered on 3:20 Monday) was unwrapped and the camera charged the sun had set so white silks seemed like the best choice. We’ll likely shoot again shortly and see how the sword and knives look with blue, red and black. The length of the blade is 40 inches or more. 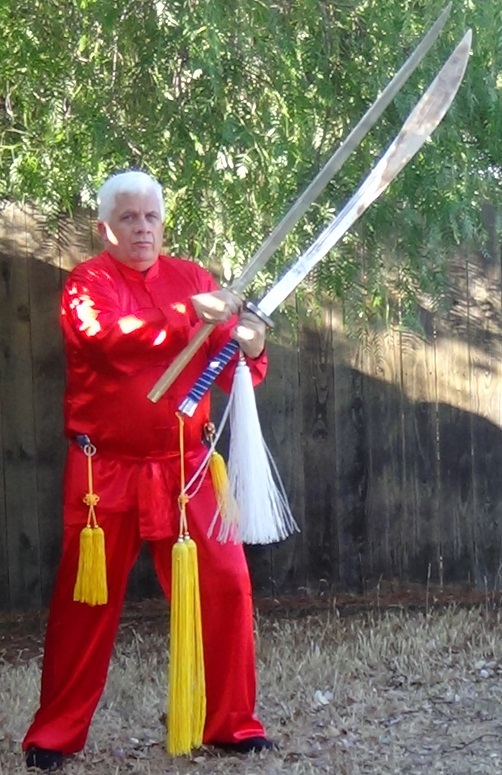 This is likely 10 or more inches longer than most straight swords and, with a 15 inch handle, comparable to a Ba Gua Big Saber. 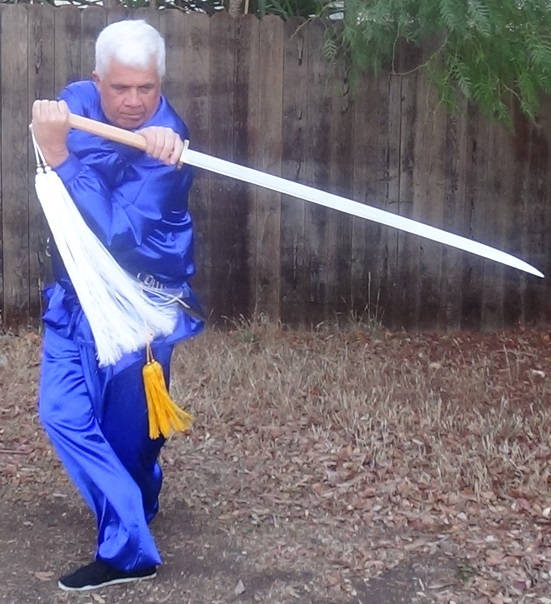 Even though the blade is comparatively light most actions involve two hands. However, at three junctures in the first Wansheng set the performer throws a knife. 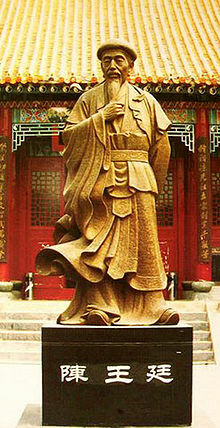 A statue of Chen Wanting (1580-1660) – by most considered the founder of Chen Family style Tai Chi Chuan. There isn’t a clear dividing line between a style and a version of a style so we would describe the following as styles: Chen, Hu Lei (Thunder), Li, Shen, Spirit Dragon, Sun, Wan Sheng (also known as 10,000 Victories), Wu, Wu (Hao), Xiao, Yang and Zhaobao. With the possible exception of Zhaobao, and even there one sees a fair amount of cross-pollination, the styles have been influenced by Chen family style in varying amounts. Chen family style itself has several versions. We believe the situation is similar to chess: there are plenty of openings for White and defenses for Black. In almost all cases one who would be a grandmaster has to have certain variations within an opening that he prefers either because of taste, the tournament situation or the opponent. In martial arts one needs to intensely study specific sets and techniques in order to master them, but it is usually worthwhile to have some familiarity with both versions of the chosen sets and with other arts. Planning to attend a two day seminar by Master Chen Zhonghua to be held in Oakland at an as yet undisclosed location with an undefined agenda. Saturday 19th and Sunday 20th from 9:00a.m. to 5:00 p.m. with an hour or so for lunch. There will also be workshops in Sacrament on Monday 21st and Tuesday 22nd from 6:00 p.m. to 10:00 p.m. The cost is $180 for both days of the Oakland event. Before the Qing Dynasty mentioned yesterday the Ming Dynasty ruled from 1368 to 1644 and had taken over when the Yuan Mongol Dynasty collapsed. This bow is based on paintings and a few precious samples from that period. 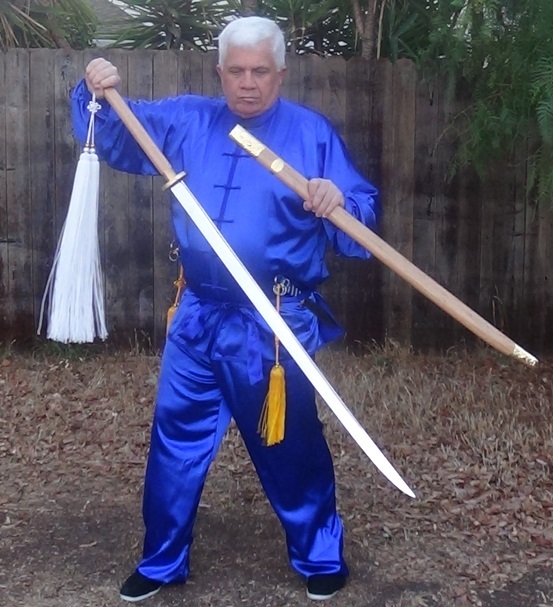 As mentioned previously, one can learn and use throwing knives, rope darts, flying weights (Fei Tou), meteor hammers, and even several of the chain whips. These are all reasonable choices, and they certainly could make an opponent think twice. But there is another weapon that is, alas, extremely rare these days, even in China. We are speaking of the first true artillery. No, not early Chinese cannons or even rockets, but rather the bow and arrow. 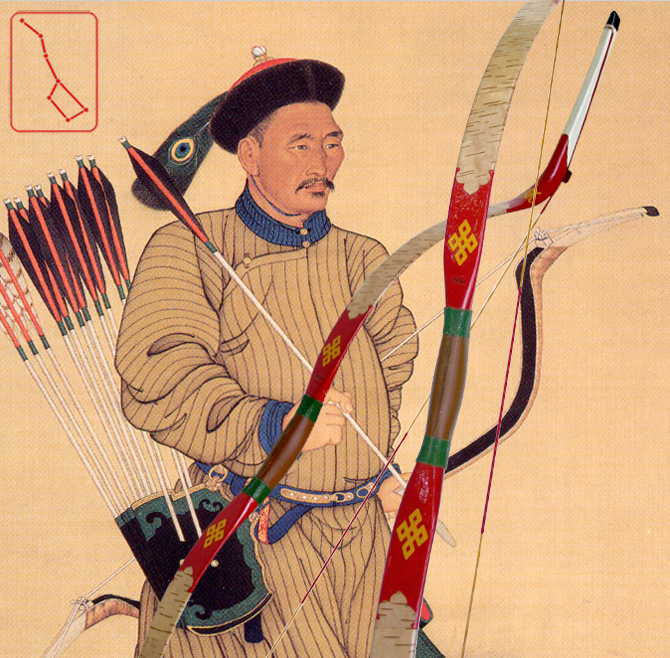 The birch bark covered bows shown above were carried by both Manchurian mounted archers and foot soldiers during the Qing conquest of China. The Qing Dynasty ruled from 1644 to 1912. These recurved bows were typically larger and heavier that those used by defenders. 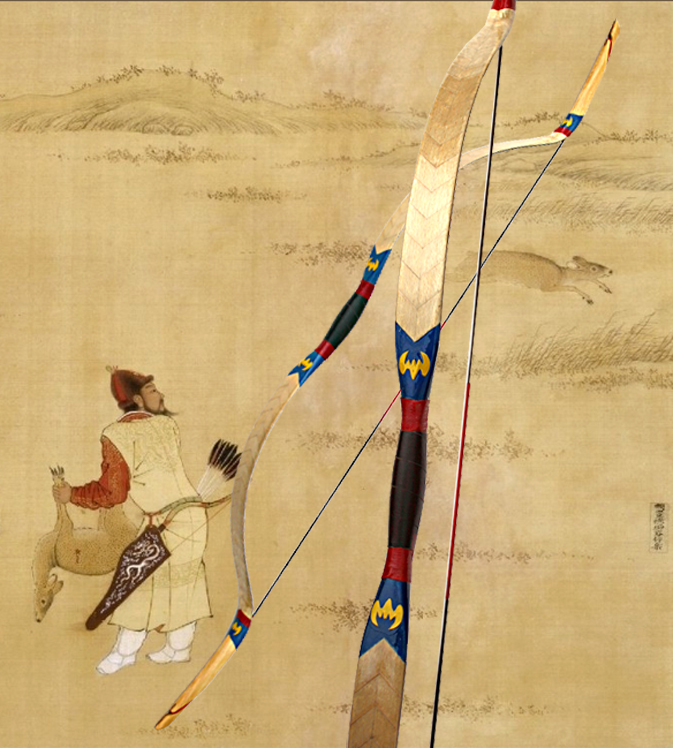 This allowed Manchurians to shoot heavier arrows further.